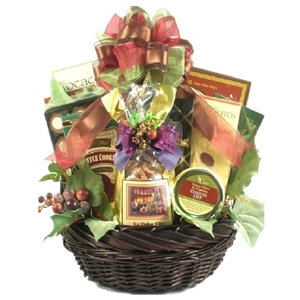 The perfect gift basket for occasions calling for a touch of elegance, this set comes in two color choices, each with its own elegant charm and delectable twist - green or burgundy. The Green Basket includes: Buttercrunch Toffee With Cashews, Chocolate Toffee Almonds, Mint Chip Maltballs, Chocolate Truffle Cookies, Butter Toffee Pretzels, Popcorn Mixed With Almonds and Creamy White Fudge, Sweet Butter Cookies, and Smoked Almonds. The Burgundy Basket includes: Buttercrunch Toffee With Cashews, Triple Chocolate Toffee, Chocolate Covered Bing Cherries, Chocolate Truffle Cookies, Butter Toffee Pretzels, Popcorn Mixed With Almonds and Creamy White Fudge, Sweet Butter Cookies, and Smoked Almonds. The name of this basket says it all. When it comes to celebratory gifts, nothing beats food to make a memorable impression. The Celebration to Remember Gift Basket is a seemingly neverending assembly of delicious treats ranging from salted goodies to sweet tooth pleasers. This gift set features a Cheese Spreader, Sparkling Cider, Focaccia Crisps, Tuscan Style Crackers, Bruschetta Parmesan Crisps, Original All Beef Summer Sausage, Cabernet Cheddar Cheese, Cheddar Cheese, Pepper Cheese, Smoked Gouda Spread, White Zinfandel Cheddar Cheese, 'La Dolce Vita' Gourmet Snack Mix, Cheddar Cheese Pesto Rounds, Assorted Hard Candy, Cranberry Harvest Medley, Mixed Nuts, California Pistachios, Gourmet Wine Chocolates, Chocolate Strawberries, Chocolate Sea Salt Caramels, Irish Cream Whiskey Chocolates, Cherry and Brandy Filled Chocolates, and Hazelnut Zebra European Cookies. A 16 inch straw hat filled with key lime tea cookies, lemon sugar cookies, chocolate chip coconut cookies, key lime white chocolate cookies, macadamia cookies, chocolate meringues, assorted tropical fruit flavored bonbons, sweetened dried tropical fruits, swiss petite fruits, lemon and key lime straws, salted pistachios, golden tortuga caribbean rum cake, a tote with peach mango fizz mix with two umbrella straws, pineapple passion fruit fizz mix with two umbrella straws, and a key lime mojito mix, this is the best possible gift set. 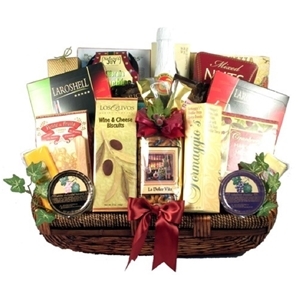 When appreciation goes beyond a simple thanks, the Great Appreciation Gift Basket is due. This set includes Mixed Nuts, Cherry Liquor Chocolates, White and Dark Chocolate Gopher Turtles, and a Cutting Board Gift Set which further includes Smoked All-Beef Summer Sausage, Vegetable Flavored Cheese Spread, Swiss Cheese, Wheat Crackers, Cheese Spreader, Smoked Salmon, Spiced Vanilla Chai Tea Mix, Caramel Cappuccino Mix, Coconut Curry Cashews (Cashews in Exotic Blend of White Chocolate, Curry and Coconut), Italian Roast Espresso Beans Lavished In Rich Dark Chocolate, Chocolate Toffee, Milk Chocolate Peanut Butter Delights, Chocolate Coconut Creations, Assorted Chocolate Grahams, Dark Chocolate Truffles, Butter Rum Cake with Jamaican Rum. A gift set that takes its name seriously, this gift basket includes Jumbo Cashews, Salted Pistachios, Smoked Sausage, 'La Dolce Vita' gourmet Snack Mix, Havarti Cheese Spread, Spring Onion Crackers, a ceramic and stainless steel cheese spreader, Hazelnut Biscotti, Bruschetta Parmesan Crisps, Honey Mustard Pretzels, gourmet dipping Mustard, collectors tin with assorted Danish Butter Cookies, Dark Chocolate Cream filled Butter Wafer Cookies, Premium Breakfast Blend Coffee, and an assortment of gourmet Cocoa. The perfect gift for someone with a sweet tooth, this set is pure joy. 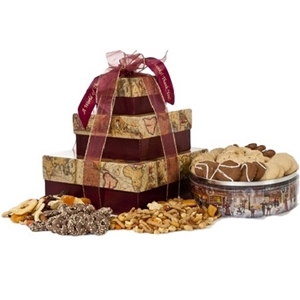 The top box includes assorted fruit hard candy, the middle be consists of Belgian milk chocolate covered pretzels, a savory snack mix loaded with nuts, sweetened dried fruit and a nut mix with the bottom box consisting of a decorative tin filled with Danish butter cookies. A gift basket with an emphasis on the finer things, this set includes 'La Dolce Vita' gourmet Snack Mix, Chocolate Truffle Cookies, Cafe Mocha Desert Chocolates, Tiramisu Cream filled Wafer Roll Cookies, Assorted Italian flavored Mocha, Focaccia Crisps Italian Crackers, Asiago Cheese Straws, Tuscan Wine and Cheese Crackers, Green Olives with Provencal Herbs, Cracked Wheat Wafers, and Spanish Olive Cheese Spread. In recent years, the corporate sector has seen a great push towards employee and client satisfaction, with more and more organizations aiming to forge a relationship with both groups on a personal level. Of the numerous means devised to act as a way of building business to individual relationships, the one that stands above all is the culture of gifting. Humans have always had a fondness for gifts, and the corporate sector is no different if we were to go by the increasing trend in investment in gifts; particularly; corporate gift baskets. 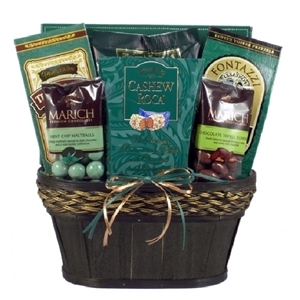 Corporate gift baskets are an assortment of various gift items, typically food samplers, placed in a basket and wrapped. They are usually presented at corporate events as a way to thank recipients for any given reason. Due to their simplicity, all-encompassing nature and ability to be easily modified, they have become the go-to gifts for the corporate sector; be it an orientation party, felicitation of an achiever, a retirement gift, a moment to express gratitude or simply a return gift or a forwarded gift opportunity, a corporate gift basket will rise to the occasion. What Makes a Corporate Gift Basket Work? Of all the corporate gift baskets, there is one common pervading theme defining their likability: food. Food titillates the hearts, souls and stomachs of each individual, and corporate gift baskets play to this very instinct. And since most corporate gifts are purchased with a long term usage in mind, the edibles provided are of categories that have the minimal risk of spoilage with time, such as wines, cheeses, cured meats, nuts, ready to eat snacks and chocolates. 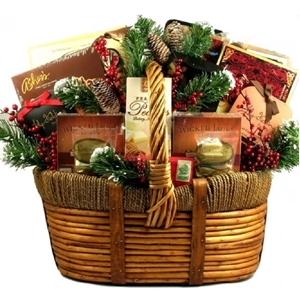 In fact, most corporate gift baskets happen to be assembled using a combination of the above! Depending on the nature of the event and personal dispositions of the recipient, you might present them with a corporate gift basket that is composed solely of the choicest selection of wines, or perhaps a basket that combines fine wines with luxurious chocolates or paired cheeses. Should you choose for the corporate gift basket to lean more towards filling items, you could pick a basket that is a delectable mix of cheeses like gouda, parmesan, or cheddar and cured meats such as salami, pastrami or chorizos. Upon receiving such a kaleidoscopic gift, the recipient is made aware of the sender’s gratitude and consideration put into assembling the perfect basket, thus strengthening the relationship, and providing joy to the recipient. And if an optional promotional product with the organization’s name and/or insignia is a part of the basket, they remember the senders as well. 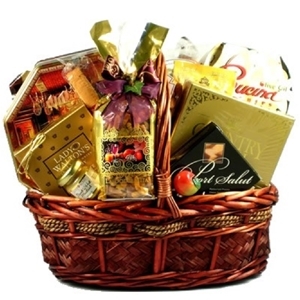 Choosing a corporate gift basket from such a vast selection can be a daunting task. CeremonialSupplies.com understands the conundrum its patrons might face, and as part of its commitment to providing the most hassle free shopping experience possible, it organizes all available choices in a simplified and easily accessible format, thus helping the patrons save precious time. 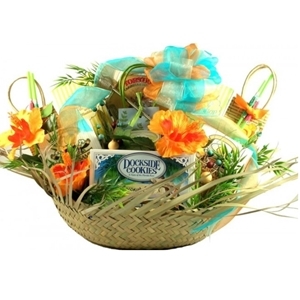 With an easy to navigate website and a relevant selection of corporate gift baskets, CeremonialSupplies.com ensures the perfect corporate gift basket for your occasion is no further than click away.